Product code: ES6454 Categories: Sold Items, Sold Rings. Wearing this Art Deco platinum sapphire and diamond ring on your finger will have you looking at your hand every moment you get as well as being admired by all who see it. Exquisitely hand made entirely in platinum during the Art Deco period of the 1920’s, one of the many advantages of platinum over gold is the pure white colour that it has and the ability to be drawn into a fine wire of platinum all the while still be able to have the strength and durability to wear it all the time. Art Deco jewellery used such wonderful geometric shapes which works so well in design and this Art Deco sapphire and diamond ring is simply spectacular in its design. Set in the centre is a 0.26 carat European cut diamond and further around the setting are twenty six more diamonds set in such a carefully thought out design. These additional diamonds total 0.32 carats and then to further enhance the ring are five square cut sapphires at each end set into a wonderful triangular design that really stands out against the pure white of the platinum and diamonds. These sapphires total 0.07 carats and really highlight the ring so well and is just one reason why Art Deco rings have never gone out of fashion and are as popular today as when they were made all those years ago. From left to right the ring measures 11.1mm across by 17.7mm and works so well to accentuate the finger. 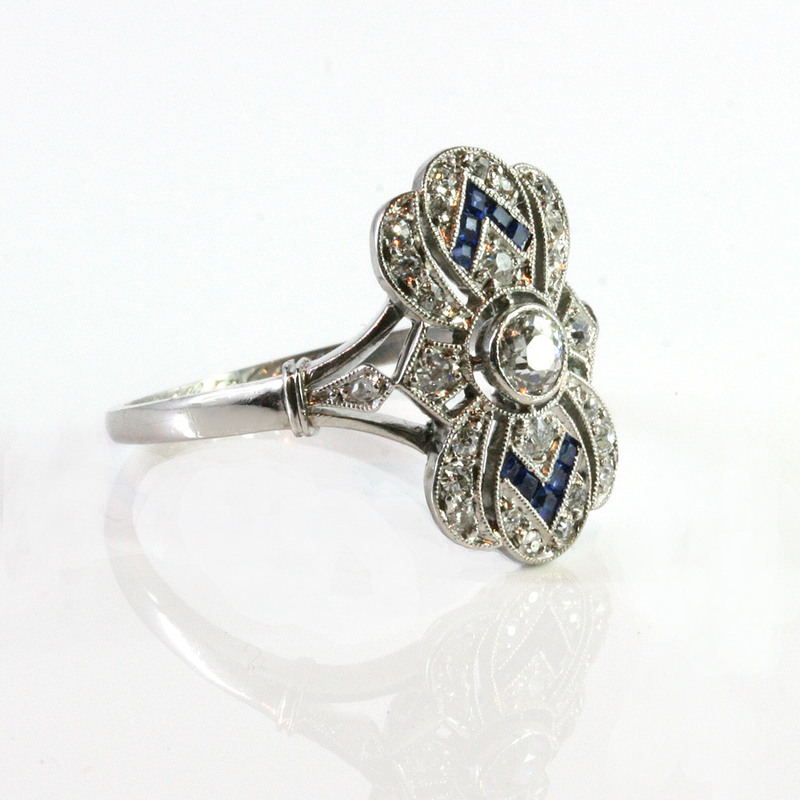 A fine quality Art Deco ring for all to admire, this ring is just perfect in all respects.